National Museum of Ireland – Natural History is ‘museum of a museum’, a ‘cabinet-style’ museum opened in 1857. Located on Merrion Square in the heart of Georgian Dublin. 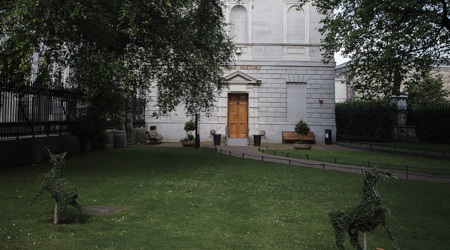 The Natural History building was built in 1856 to house the Royal Dublin Society’s growing collections, which had expanded continually since the late 18th Century. The building is a ‘cabinet-style’ museum designed to showcase a wide-ranging and comprehensive zoological collection, and has changed little in over a century. Often described as a ‘museum of a museum’, its 10,000 exhibits provide a glimpse of the natural world that has delighted generations of visitors since the doors opened in 1857. The building was designed by architect Frederick Clarendon in harmony with the National Gallery of Ireland on the other side of Leinster Lawn. The foundation stone was laid on 15 March 1856 and the building was completed in August 1857 by contractors Gilbert Cockburn & Son. In April 2010 the Museum reopened after restoration works that included the reinstatement of the grand stone staircase, open to the public for the first time in decades. On the upper floor you will find anelephant, polar bear, lions, an array of monkeys, apes and lemurs which make up the Mammals of the Worldcollection. The Discovery Zone within the Museum gives adults and children a unique chance to get to grips with a Badger and a Pilot Whale skull. This hands-on area has two mobile units with the themes: Life on Land and The Life Aquatic.